A municipality (Georgian: მუნიციპალიტეტი, munits'ipaliteti) is a subdivision of Georgia, consisting of a settlement or a group of settlements, which enjoys local self-government. There are two types of municipalities—self-governing cities (ქალაქი, k'alak'i), 12 in total, and self-governing communities (თემი, t'emi), 64 in total. The municipalities were first established in 2006. Most of them were successors to the earlier subdivisions, known as raioni (რაიონი), "districts". In addition, new municipalities were formed to govern those settlements in the disputed entities of Abkhazia and South Ossetia that then remained under Georgia's control. After the Russo-Georgian War of 2008, Georgia treats these municipalities as parts of its occupied territories. The former districts not under Georgia's effective sovereignty at the moment of the local government reform of 2006 were not transformed into municipalities. Rather, the laws of Georgia include a notion that the final mode of subdivision and system of local self-government should be established after the restoration of the state jurisdiction over the occupied territories. In 2014, the system of local government was further reformed and a total number of municipalities were increased at the expense of adding more self-governing cities. Each municipality is divided into administrative units (ადმინისტრაციული ერთეული), which can comprise one or several settlements. The municipalities outside the two autonomous republics of Adjara and of Abkhazia and the capital city of Tbilisi are grouped, on a provisional basis, into nine regions (mkhare): Guria, Imereti, Kakheti, Kvemo Kartli, Mtskheta-Mtianeti, Racha-Lechkhumi and Kvemo Svaneti, Samegrelo-Zemo Svaneti, Samtskhe-Javakheti, and Shida Kartli. *– The territories of Abkhazia outside Georgia's control and defined by Georgia as "occupied territories" as of 2015. **– These municipalities which include settlements in South Ossetia outside Georgia's control and defined by Georgia as "occupied territories" as of 2015. ***– Official statistics available only for those parts of the municipalities that are controlled by Georgia. ****– Official statistics are not available for the territories not under Georgia's control (Abkhazia and South Ossetia). 1 2 "ტერიტორიული მოწყობა და მმართველობა [Territorial Structure and Government]". 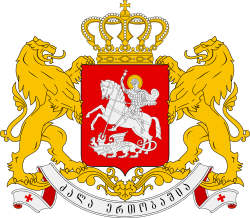 Administration of the President of Georgia. Retrieved 9 July 2015. ↑ ადგილობრივი თვითმმართველობის კოდექსი [Code of Local Self-Government], Organic law No. 1958-IIს of 5 February 2014 (in Georgian). Retrieved on 9 July 2015. ↑ "Transparency remains a challenge for self-governing cities". Transarency International Georgia. 28 October 2014. Retrieved 9 July 2015. ↑ Department of Statistics Under Ministry of Economic Development of Georgia Archived November 18, 2008, at the Wayback Machine.